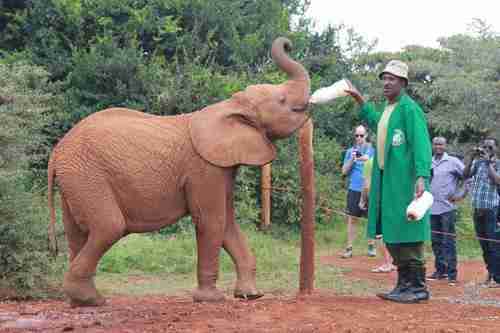 Don't even think about being late for your visit to the David and Daphne Sheldrick Elephant Orphanage in Nairobi, Kenya. I was running late. Traffic isn't the right word to describe what happens on Nairobi's roads starting at 6 a.m. We had been sitting, just sitting, for twenty minutes before I grew anxious. "I'll walk. I can walk," I said to my driver. He shook his head. "No really. I can do it. I just really need to see these baby elephants." 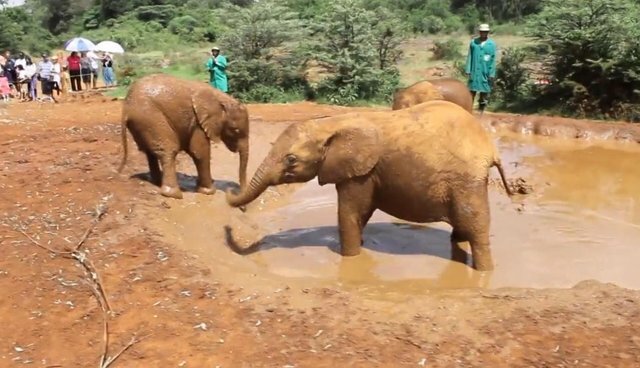 Arrive at the orphanage just five or ten minutes after 11 a.m. and you are likely to miss one of the most adorable experiences of your life - baby elephant bath time. This elephant orphanage on the northern edge of Nairobi National Park is home to more than twenty baby elephants, all victims of poaching or abuse at the hands of humans. 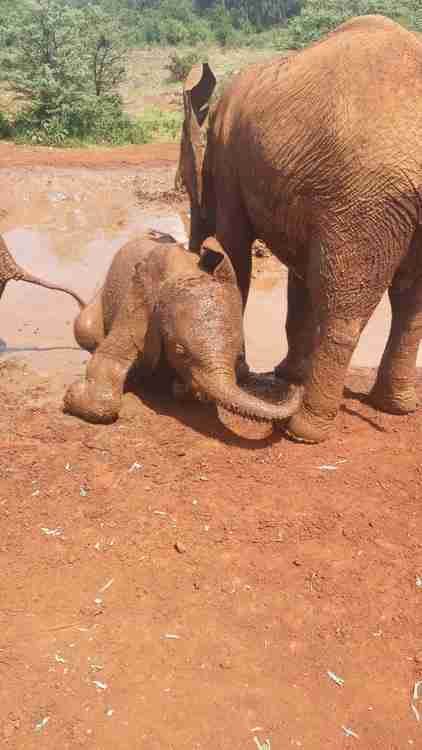 They live in the orphanage between three and 10 years until they are returned to Tsavo National Park. Over 135 elephants and 17 rhinos have been saved by the David Sheldrick Wildlife Trust, originally founded by the conservationist David Sheldrick and carried on by his wife Daphne. The nursery is only open to the public for one hour a day from 11 a.m. until noon. Right at the stroke of 11, the orphanage caretakers wearing bright green coats and khaki sun hats lead a procession of babies to the watering hole. The wrinkly brown creatures hesitate for a minute before tapping one foot into the water and then a trunk before fully taking the plunge. 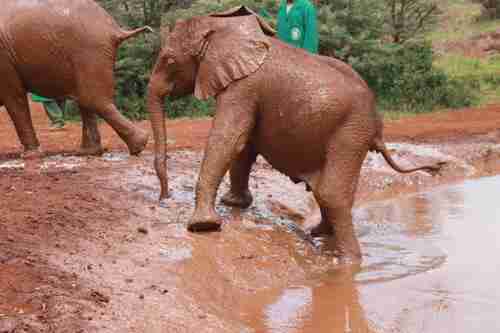 It's hard not to feel wonderful about the universe while watching a scrum of baby elephants roll around in the mud. A line of ropes separate the public from the elephants, but the babies pay it no mind and will walk right up to say hello, nuzzling anyone who sticks out a welcoming hand. Each baby is introduced over a loud speaker along with a brief bio that includes how they ended up at the orphanage. Many of their mothers were poached and baby elephants rarely survive without their mother's milk. After bath time the babies are fed by bottles containing a special formula developed by Daphne Sheldrick over years of trial and error. Since it is so easy to fall in love with the orphans and the orphanage requires donations to remain up and running, they allow guests from all over the world to adopt a baby elephant. Sadly that does not mean you can take it home. I asked. For just $50 you receive regular updates on your orphan via e-mail, a copy of his biography, an adoption certificate and a painting of the orphan. Adoptive parents also get a very special perk. They can make a special appointment at 5 p.m. to help put the babies to bed, avoiding the crowds of tourists.